On the lookout for gutter, soffit or fascia fitters in Chorley? Our gutter, soffit and fascia firms in Chorley are able to supply you with the ideal quotations for having guttering fitted or restored. Guttering is essential for your home's waterproofing and weatherproofing and it's vital to have it correctly maintained. Build-up of debris and water can be quite normal in guttering which will cause blockages. 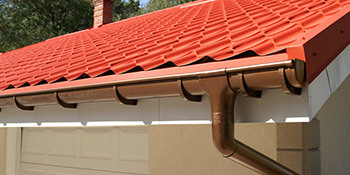 Gutter assembly is a difficult process and needs to be completed by a qualified expert. Brackets and pipework must be safely attached, whilst the drainage should be properly assessed. We're able to supply you with around 4 guttering firms in your area, who will give quotations for the work you'd like undertaken. You'll get a property visit from professionals in Chorley who'll install the guttering, soffits or fascias for a very good price. The fitting of guttering, soffits or fascias will probably take one or two hours hours based on the amount of work required. The market town in Lancashire is the biggest settlement in the Borough of Chorley. It's just 8.1 miles north of Wigan and it has a population of 31,556. The town of Chorley is located in the North West of England and contains history extending to the Roman age. For property improvements within Chorley, make certain to work with vetted experts in your town to guarantee a high quality finish at an great price. Guttering companies (Gutters, gutter clean, downpipe) in Chorley. They are going to provide you quotations in Chorley for gutter set up. Quotatis are devoted to finding you the perfect costs in Chorley by assessing more than 100 firms. All guttering businesses we assess are endorsed and regularly evaluated by brand new consumers, making sure good quality and professionalism. Project: Plastic facias and soffits and new guttering on detached house and detached garage in rosewood colour. Project: Work description: Need new guttering soffits request cheapest quote. Project: Customer visited the myguttering.co.uk site and submitted an enquiry. Property type: Detached, Property owner: Owner, Work description: Need new guttering soffits request cheapest quote. It was available on my phone so I could use easily. We noted 835 requests for house quotations in Chorley. Of these quote requests the amount of guttering soffits and fascias quotes within Chorley was 1. Quotatis would have been in a position to match these customers with up to four suitable contractors who were available for work in Chorley during those times. Request a free house survey from reliable companies within Chorley. Beneath you will find the UK's overall populace based upon regions of the country. The entire population of the United Kingdom is now over 62 million, with London and the South East keeping quite a large percentage of this. In contrast, Northern Ireland and the North East of England hold the least occupants in the entire the UK. The graph underneath illustrates the overall number of photovoltaic installations within Chorley. Solar power panels have increased in popularity mostly due to the Government's rewarding feed-in tariff incentive, which pays out for each and every unit of environmentally friendly electricity generated. Join these property owners and begin producing your own electricity today. The data underneath illustrates the typical home price in Chorley. On the whole, house prices have increased in value considerably during the last ten years. Nonetheless, in recent times prices appear to have stagnated and it's essential to improve your home to add value. The information beneath shows the house market for the last seven years and exactly how many homes have sold within Chorley. Due to large expenses associated with moving home, many people are now opting to stay put rather than relocate. Home enhancements are becoming a lot more popular as people look to improve their property. Have a home improvement job and need a recommended tradesperson? Quotatis will help you find the best installer in Chorley and nationally, so you get the best possible prices. Simply search for your project and request up to 4 quotes.